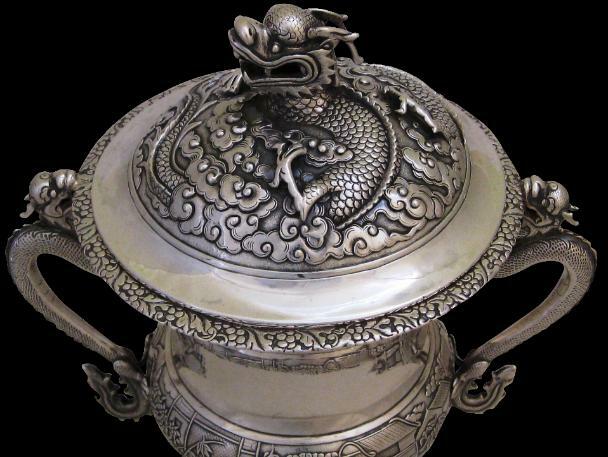 Lidded standing cups are among the most monumental and elegant examples of Chinese export silver. This example is particularly fine. 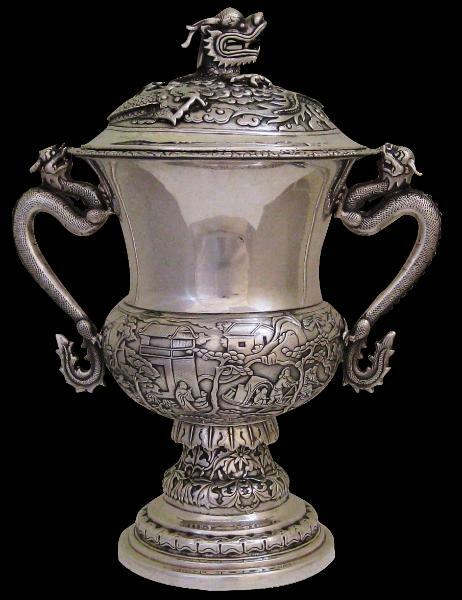 It is also relatively early – mid-nineteenth century Chinese export silver of such grand proportions is becoming increasingly rare. It is made of solid, thick gauge silver (it weighs over one kilogram). Two applied rampant dragons comprise the handles and the lid has been beautifully cast with a dragon that has been asleep, his long body curled among the clouds and that is now beginning to stir. His head is starting to rise, but with his horns drooping down. This form of decoration for a cover or lid was used by Khecheong elsewhere. A strikingly similar example is illustrated in Forbes et al (1975, p. 71). 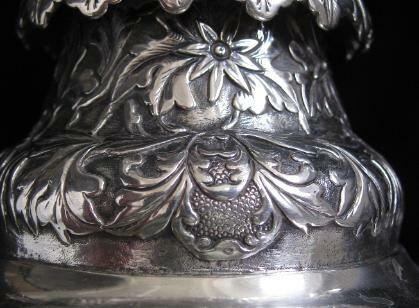 The lid sits in the cup which has an elegant, scalloped rim chased with leaves and flowers. 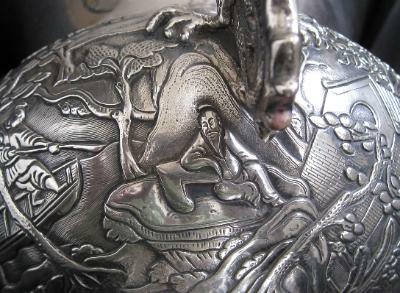 The body has a plain upper section and an elaborate lower half that is chased with village and other typically Chinese scenes all amongst borders of trees and rocks. The stem is chased with leaves and flowers including chrysanthemums with a leafy fringe, and the foot is tiered and chased. 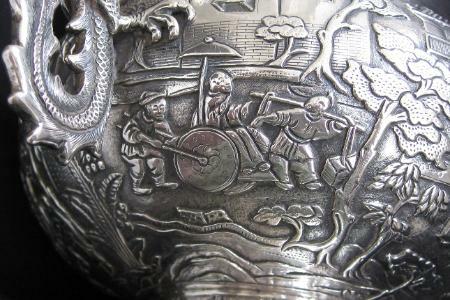 The cup is marked to the inside of the base with ‘KHC’ and pseudo English hallmarks. A cup and cover of similar form although by a different make is illustrated Kernan (1985, p. 85). Another appears on the back dust jacket cover of Forbes et al (1975). Khecheong was a maker and perhaps retailer of fine silver between approximately 1830 and 1875. 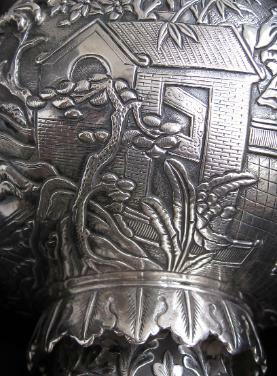 The firm’s premises were at Club Street, Honam Island, south of central Guangzhou, near other well known silversmiths and retailers, such as Leeching and Hoaching. 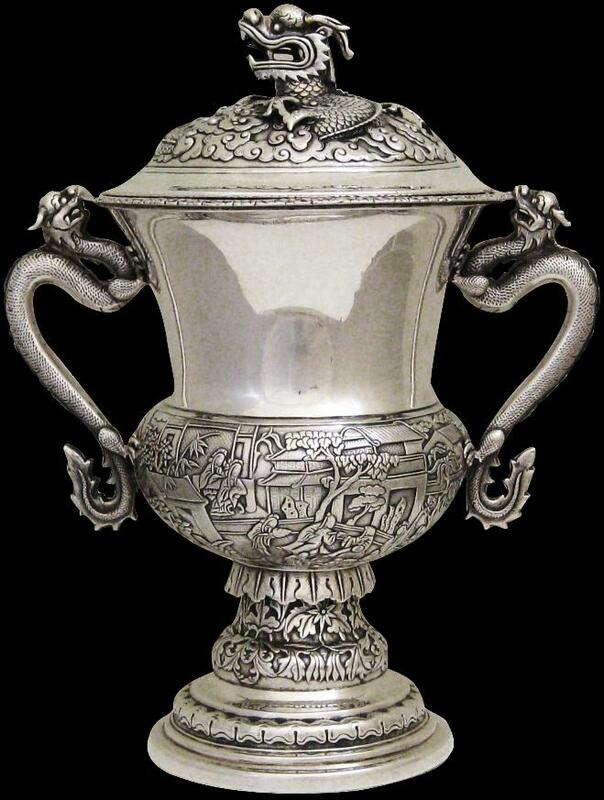 Overall, this is a very fine example of monumental, mid-nineteenth century Chinese export silver. It is heavy to hold and of the highest quality. Acquired from the UK art market.